One of the biggest stories in the sport of Boxing in 2017 took place on July 1st at Suncorp Stadium in Brisbane, Australia where future Hall of Famer Manny Pacquiao took on undefeated contender and hometown favorite Jeff Horn in an encounter known as “The Battle of Brisbane.” A fight that saw the undefeated, but largely unknown Horn pull off the upset of the year dethroning Pacquiao via twelve round unanimous decision to win Pacquiao’s WBO Welterweight world championship. The victory for Horn however, was overshadowed by “Controversy.” Despite the “Game” effort put forth by Horn during the grueling battle, many throughout the sport as well as Boxing fans felt that Pacquiao deserved the decision and it created an atmosphere where the new champion could not enjoy his victory. As readers might recall in this observer’s coverage of that fight, I was one of many in the sport who felt Pacquiao had won the fight as I scored it eight rounds to four or 116-112 in points in his favor. 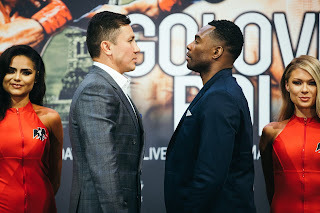 While discussing what I felt was “A Great Fight With A Shadow Of Controversy “, I concluded my coverage by saying the beauty about Boxing is there is always a remedy for a “Controversy”, “A Rematch.” Although the outcome of Pacquiao-Horn certainly warrants a return encounter, a second fight between the two has not materialized and it remains unclear if a rematch will take place in the future as it is uncertain whether the former world champion and politician Pacquiao intends to continue his career as a fighter. With a second encounter with Pacquiao not likely at least in the near future, Horn will make the first defense of his WBO Welterweight world championship against current WBO number ten Welterweight contender Gary Corcoran on Wednesday night at the Brisbane Exhibition and Convention Centre in Brisbane, Australia. The fight, which will be televised live on Wednesday morning here in the United States by ESPN has an interesting similarity to Horn’s battle against Pacquiao. Much as was the case when Horn stood across the ring from Pacquiao earlier this year, Corcoran is not particularly well known outside of his native England and has never fought outside of the United Kingdom in a similar way as the champion, who has not fought outside of Australia and New Zealand in his career thus far. The challenger will also enter into this fight with a similar record to Horn of 17-1, with 7 Knockouts compared to the champion who will come into the fight with a record of 17-0-1, with 11 Knockouts. In his only defeat as a professional, Corcoran was stopped in eleven rounds at the hands of former British and Commonwealth Jr. Middleweight champion Liam Williams in July 2016. Since that setback Corcoran has won two fights including earning a twelve round split decision over Larry Ekundayo in his last bout in July of this year. Where the similarities between champion and challenger end one might argue is in regard to experience. Despite his impressive record, Corcoran has not scored a victory over a fighter that most would consider to be a household name in his career thus far. This differs from Horn, who had scored knockouts of former Welterweight world champions Ali Funeka and Randall Bailey prior to facing Manny Pacquiao earlier this year. Although neither Funeka or Bailey were at or near the top of the Welterweight division at the time Horn fought them, the experience of having faced and defeated two former world champions gives Horn the edge, despite neither fighter being necessarily well known to the casual Boxing fan. Stylistically, this appears to be an encounter between two offensive-minded fighters who are known for being aggressive and like to throw punches in bunches. Despite being out landed by ninety punches in his world championship win over Manny Pacquiao, Horn was consistently aggressive throughout the fight and that in addition to out throwing Pacquiao by fifty-two punches was perhaps the key component that left an impression on the official judges that ultimately resulted in Horn winning the fight via decision. Corcoran is a fighter who much like Horn likes to come forward and apply consistent pressure from the outset. The difference in this fight might come down to who is able to land the more distinguishable offense as both fighters are capable of throwing combinations and each are capable of establishing an attack to the body and head of their opponent. This could cause a conundrum with regard to the scoring of the fight should it go the distance because it may not be as simple as being able to establish which fighter is able to dictate the pace and control the combat because the styles of the two fighters are similar. If the fight materializes into the action fight it appears it could be on paper, there might be fireworks in this encounter. What is at stake for the champion Jeff Horn beyond obviously his world championship is he needs to make a statement in his first title defense. A statement not only to continue establishing himself as a significant player in the traditionally talent deep 147lb. Welterweight division, but also to attempt to answer some of the criticism he has faced since winning his championship from those who feel he benefited from an unjust decision, despite the “Game” performance he put forth in that fight. It is in some ways a similar position as former multi-division world champion Timothy Bradley found himself in following his own victory over Pacquiao in 2012. Much like Horn, Bradley was believed by many to have benefited from an unjust decision that resulted in significant backlash from Boxing fans and experts including yours truly. Although much of the criticism that followed the first of what ultimately became three fights between Bradley and Pacquiao was directed at the Nevada State Athletic Commission and the three official judges who scored the fight, criticism was also unfairly directed at Bradley, who despite the controversy showed his mettle in that fight fighting injured with pulled ligaments in his left foot throughout the entire fight. In his first title defense following the victory over Pacquiao, Bradley engaged in a twelve round war with Ruslan Provodnikov in a battle that was named by many media outlets including Ring Magazine as 2013’s Fight of the Year. If one were to take a survey of a group of Boxing fans or experts and ask the question of whether Bradley truly recovered from the backlash that was unjustly thrown in his direction following his victory over Pacquiao, you would likely get a healthy difference of opinion when results were tallied. The battle with Provodnikov clearly established Bradley however, as a fighter who was willing to get in the ring and defend his championship, the same crown that Jeff Horn currently holds against all challengers. A quality that regardless of how one feels about Bradley’s victory over Pacquiao should be respected and applauded by all Boxing fans. It is now time for Jeff Horn to show in spite of the controversy that like Bradley, he too is a fighter’s fighter and take the first step toward putting the controversy behind him. Before potential fights with the likes of Pacquiao, Keith Thurman, and Errol Spence can be discussed, Horn must pass what could be a tough test. As Horn proved earlier this year, Boxing is truly a sport of opportunity and it only takes one fight for a fighter to go from a relative unknown to a rising star. Can Gary Corcoran capitalize on the opportunity that now awaits him? We will find out on Wednesday, December 13th. Horn vs. Corcoran takes place on Wednesday, December 13th at the Brisbane Exhibition and Convention Centre in Brisbane, Australia. The fight can be seen live in the United States on ESPN beginning at 6:30AM EST/3:30AM PST and will also be available on the ESPN and Watch ESPN apps. There will be a replay of Horn-Corcoran aired on Wednesday evening on ESPN 2 at 9:30PM EST/6:30PM PST. For more information about ESPN, ESPN Boxing, and the ESPN and Watch ESPN apps please visit: www.espn.com. Check your listings internationally.